As the development of IoT and cloud technology, lots of Energy & Environment practices have evolved to remote management using cloud service for further analytics, visualization, virtualisation and machine learning. However, there are still many difficulties system integrators and equipment operators need to overcome, including getting data from wide area, connecting it to different cloud service and making data visible and applicable. To shorten the gap and accelerate our customers’ time-to-market, Advantech it devoted to offering Solution Ready Package (SRP) for Energy & Environment markets based on our success of both hardware/software products and domain experience, such as substation, renewable energy, water treatment, and pollution management. During the Cigre event Advantech will present unique solution - together with our partners - Intel. Ekinops and Stormshield. If you would like to know more - please see the dedicated page HERE. Advantech’s powerful TUV certified ECU-4784 Embedded PC has been specifically designed to meet the critical requirements of power automation. 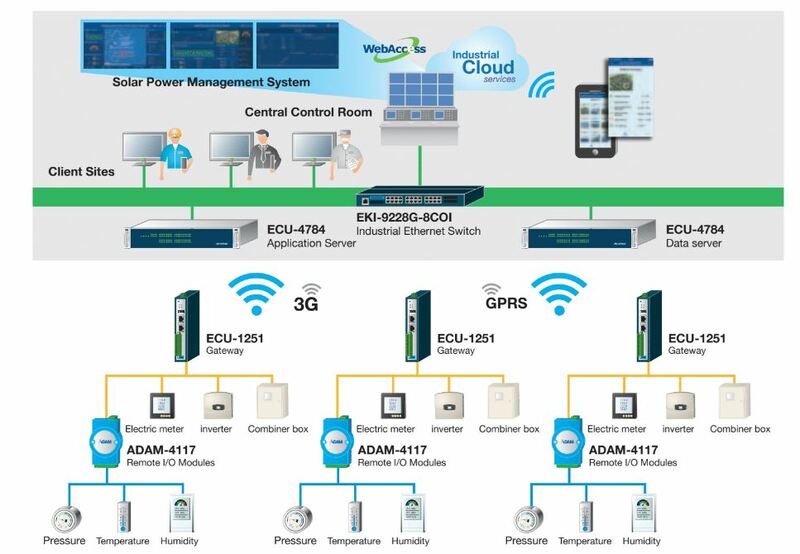 IEC-61850-3 and IEEE1613 certification demonstrates the ECU-4784 suitability for electrical power communication protocol conversion, intelligent remote data analysis, network communications security and comprehensive monitoring applications, which provides higher reliability and stability, specially suitable for global power automation, energy automation and harsh environments. Advantech provides gateways and remote acquisition modules that support multiple power communication protocols easing the difficulties faced when trying to get data from multi-vendor PV equipment. In addition Advantech offers several products to integrate data within a certain area and transfer it to the plant operation & control center through a 3G/4G/GPRS communication network. Furthermore, Advantech’s Industrial Ethernet solution helps to ensure smooth and secured data transmission. Advantech can also help you understand the operating status of your equipment even if it is far from the PV farm. Advantech’s real-time cross-platform (Window / iOS / Android) remote operation management solution enables timely control and maintenance of equipment enhancing the efficiency and safety of PV plants. To ensure the smooth operation of the power stations, Advantech Solar Power Management System provides multiple protocol support to monitor equipment status, data accuracy and connections. Furthermore, data auto restores after network reconnection to ensure the data accuracy. Furthermore, the GIS integrated system empowers users to monitor all sites with video for security purposes. Visit our booth 229 (2nd floor) and meet up with Tony Milne, Power and Energy market Business Development Manager to find out more about Advantech offer.